ryan alissa ella & anna: got toys? Ella has been a little bit of a terror lately. I blame this partly on the 3 teeth (2 of which are molars) that are coming in. But I also think she is a little bored. I haven't bought her many toys and I think she is tired of the tupperware and baby toys we've got lying around. But what to buy? Speak and Say? Crayons? Leap Frog? I feel a little overwhelmed. What's the best thing you've found to entertain your one year old? Oohh--I loved the popper when I was a kid. Good idea. 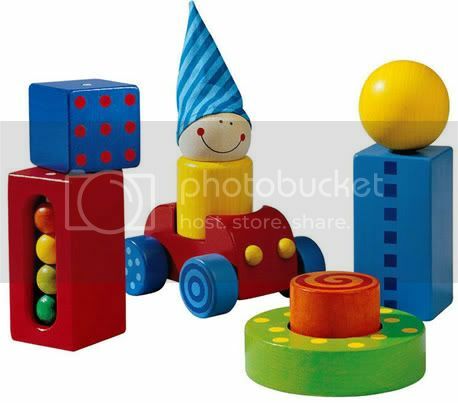 The classic blocks are a big hit in the nursery. They stack them up and then knock them down and then stack them up again. The Leap Frog Barn for the fridge door! A-MAZING! Harm was enthralled with it. We recently upgraded to ABC's for the fridge and he loves that too! If all else fails I just opened the fridge and let him play in the vegetable drawer? I would second the fridge toys! It makes making dinner so much better! Also, we have recently (although a few months ahead of Ella) discovered the crayons that Crayola makes for little hands and Maddie LOVES them! Books remain our favorite toys and we can look at those for hours! Hope Ella has a fabulous 1st birthday! i've become a regular reader, it's true. and while i'm not going to chime in on the toy suggestions, i will say that i loved your blog of 'getting things off your chest.' it was so great. straight-forward, simple, and made me realize that all my random thoughts and fixations are 'normal'. let's be friends. Bea loves finger puppets, especially the ones with different textures. I have a giant plastic bin of them plus plastic animals that Henry loves to play with and Bea has gotten really interested in them. Ikea has some cheap and cute ones. I also just got a really darling shopping cart from PLAN TOYS with a ton of the vegetable and food accessories. She pushes that around everywhere and puts things in and takes them out. She really enjoys the process of filling something up and taking things out again. BTW, if you look up PLAN toys you'll fall in love, but everything is pretty expensive so I apologise in advance if I cause you excessive spending! I actually bought the barn Jess was talking about for Ella's birthday. Cole is a huge fan also...he got his from Harm; so I thought I would make it a tradition! I know in Harlem a really popular toy with the little girls is a little fold-up stroller. They LOVE pushing them around with dolls. (Though I think they have been known to cause many a fight on the playground.) The girls here a just a bit older than Ella, so maybe this would be good in a few months. Something to push....something to stack.......something to put things in and out of.....something to ride.......something on the fridge door, lots of books. Tha'ts what Ryan loved at Ella's age.